Mimi: [about Shotu] You're so pretty. You could be a girl. Why can't we have more movies like this? It's one of the most beautiful movies I've watched in a while. 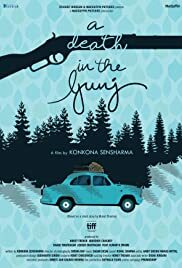 While other movies in this genre (practically non-existent in Bollywood) generally take up to 20 minutes to build up to the main story this one is intriguing right from the start. We know that someone's going to die, and we know who it is, 5 minutes into the movie. But this ain't a murder mystery. It's about the events leading up to the death. It's about the characters developing, intermingling. Beautifully shot, with a calm, fantastic soundtrack (which, sadly isn't available to listen anywhere right now), I wish there were more movies like this. I regret not being able to watch this when I could in the theatres (thanks Amazon).